So I'm pretty excited to introduce you to the online store Prairie Charms. Recently I was approached on Twitter asking if I'd like to participate in the 'Project Blogger'. Project Blogger is an initiative where I (and all the other bloggers) receive 50% off of anything on their website. Immediately I felt in love with everything on their website and after realising that they donate a cut of the profit to the Great Ormand Street Children's Hospital Charity, I couldn't wait to get involved! After waiting one week, what definitely is not a long time for a package that came all the way from the UK right here to Switzerland, I received my order today in a very shiny gold bag. 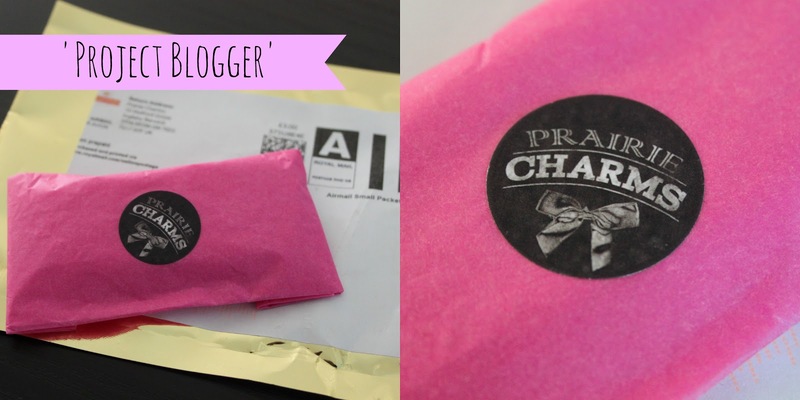 After opening that really glamorous package, I found my bracelet wrapped in pink tissue paper. I was browsing the site and I found a really cute bracelet that I just had to get it - The Sadia Bracelet with a gold feather. This bracelet fits perfectly around my wrist and I absolutely love these white gemstone beads. It fits just right in my jewellery box. The whole ordering process was very simple and all things on their website are kind of girly, floral and quirky - there's definitely something for you too! I will definitely be buying some more jewellery from this company! That's very pretty. I'll have to check out the website :) Thanks for sharing!